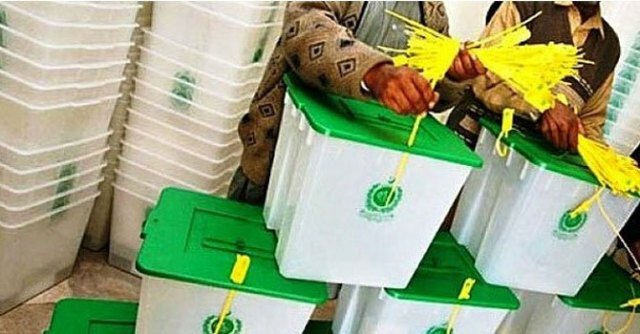 Top leaders of the main political parties hailing from different parts of the country are planning to contest the upcoming polls for more than two eats beyond their hometown constituencies. Pakistan Tehreek-e-Insaf (PTI) Chairman Imran Khan will contest elections from NA-1 (Peshawar-II), NA-55 (Rawalpindi-VII), NA-71 (Mianwali-I), NA-126 (Lahore-IX). Khan will contest against Hanif Abbasi of PML-N in Rawalpindi for the NA-55 seat. Pakistan Muslim League-Nawaz (PML-N) President Muhammad Nawaz Sharif will contest the election for NA-68 (Sargodha) and NA-120 (Lahore). Sources said that Nawaz Sharif was not in favour of pitting the main leaders of the party on more than two seats to avoid by-election in vacated constituencies. Meanwhile Chaudhry Nisar Ali of PML-N will contest for two constituencies, NA-52 and NA-53, Rawalpindi. Jamiat Ulema-i-Islam-Fazl (JUI-F) chief Maulana Fazlur Rehman will try his luck for the National Assembly in three Khyber Pakhtunkhwa constituencies, NA-27 (Lakki Marwat), NA-25 (Tank) and NA- 24 (DI Khan) in the upcoming elections. Chaudhry Pervaiz Elahi will contest for two constituencies NA-61 (Chakwal) and NA-105 (Gujrat). Awami National Party (ANP) President Asfandyar Wali Khan will contest for NA-7 Charsadda in his native district from where he was elected to the National Assembly in the 2008 general elections. He had lost another National Assembly seat from Swabi district in the same election. Qaumi Watan Party (QWP) chief Aftab Sherpao, who belongs to Sherpao village in Charsadda, will contest from his hometown constituency NA-8. He had won this seat along with a provincial assembly seat in the 2008 polls. His son Sikandar Hayat Sherpao, who is also provincial chairman of the QWP, will contest for provincial assembly seat from Charsadda. PML-N Vice President Amir Muqam would again contest polls from his native Shangla district from where he was elected to the National Assembly in the 2002 and 2008 general elections. In the 2008 polls, when Amir Muqam was provincial president of PML-Q, he had also contested from NA-4 and lost to ANP candidate Arbab Zahir Khan. Jamaat-e-Islami (JI) deputy chief and former senior provincial minister Sirajul Haq had been nominated to contest for the Khyber Pakhtunkhwa Assembly seat from his native Lower Dir district where his main opponent would be ANP’s outgoing provincial minister Hidayatullah. Asif Luqman Qazi, son of late Qazi Hussain Ahmad, has been nominated by the JI to contest for NA-5 (Nowshera). Maulana Hamid-ul-Haq has been nominated to contest for NA-6 (Nowshera) by his party, Jamiat Ulema-i-Islam-Sami. He was elected to the National Assembly on this seat on the MMA ticket in 2002 but didn’t take part in the 2008 polls in which ANP candidate Masood Abbas Khattak emerged victorious by defeating Mian Jamsheduddin of PPP-Sherpao and Mian Muzaffar Shah of PPP. Pakistan Muslim League-Likeminded (PML-LM) Chairman Salim Saifullah Khan is going to contest election from his own town Lakki Marwat while Pakistan People’s Party (PPP) provincial president Anwar Saifullah Khan will contest for a provincial assembly seat from his native Lakki Marwat. The ANP has nominated former Khyber Pakhtunkhwa chief minister Ameer Haider Hoti to contest from NA-9 Mardan in his native city and from PK-23 Mardan. His rival in NA-9 would be PML-N’s Khwaja Mohammad Khan Hoti, who had quit the ANP to join Imran Khan’s PTI before gravitating to Nawaz Sharif’s party. Nabeel Gabol of MQM will contest for two constituencies, NA-246 and NA-248. Jamshed Dasti is the only independent candidate who will contest for two seats, NA-177 and NA-178.